Grain sustainable harvested from the Andean highlands in Peru. 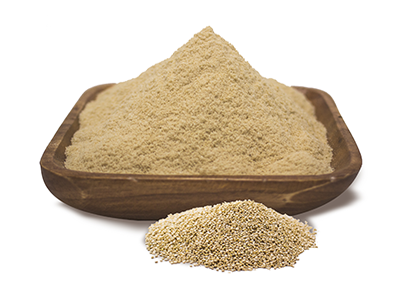 Quinoa grains are gently extruded and specially grinded to obtain a water soluble powder. Up to 15% complete plant based protein with all essential amino acids in an ideal balance. It is high in lysine an amino acid that is low in other grains. Natural source of dietary fiber, B-group vitamins, calcium, iron, magnesium and phosphorus. Ready to use powder with a delicious mild nutty taste to be used with juices, smoothies, water, yogurts, granolas and baked goods. It has a better digestibility and solubility than quinoa grain and quinoa flour. Great source of amino acids for muscle growth and repair. High in vitamins and minerals for good health maintenance.